If all goes according to plan, we will start our voyage on June 1. And things are going pretty well--so far. Cap has installed the pair of new motors and hooked them up. Even though the new diesel generator is not yet in place, with that task complete, she was ready to swim. At left, she's getting lowered into the water. Anyway, there she was, ready to cruise. 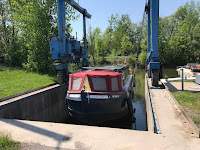 She needed to move from the launch basin, past the fuel dock, around the corner, and into her own slip at the marina. Just a few hundred yards. But when Cap goosed the throttle . . . nothing happened. Hmmmm. Back in Cap’s basement workshop, the new twin motors seemed to work just fine. They could turn the transmission shaft forward, or in reverse. But that was at super low speeds, turning against air. It turns out that, at our (faster yet still slow) ordinary speed of travel, the motor can only turn the shaft in one direction. And as wired, that direction was “reverse.” Hence no forward motion. Giving New Meaning to the Expression "Manual Transmission"
The boat couldn't sit in the launch basin all day--there were other boats to launch. Peter Wiles to the rescue! Peter is president of Mid-Lakes Navigation, the company that built our boat and that runs Mid-Lakes Marina (where we keep our boat). He gamely jumped down into the engine room and in a few minutes had adjusted the transmission so the boat would go forward. That got Dragonfly out of the basin. 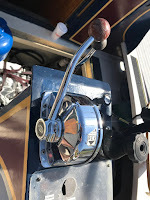 But boats need a reverse gear just as much as they need "forward," in particular to take the "way" (forward momentum) off as the boat approaches the dock. So Peter stayed down in the engine room, manually shifting from forward to reverse to forward and etc. as Cap maneuvered the boat into our slip. Thanks for saving the day, Peter! Happily Cap already had the solution at hand--a Morris control he'd bought used, at a marine supply store, ages ago. This good-looking chunk of chrome, now mounted on the steering podium, interfaces with the transmission and allows us to shift (forward, neutral, reverse) at the touch of a lever. So civilized! Where’s your home water? Will we see you?